Airbus Defence and Space has named Fernando Alonso (58) as Head of its Military Aircraft business unit as per 1st of March. Bernhard Gerwert, CEO of Airbus Defence and Space, will act as interim Head of Military Aircraft until this date. Fernando Alonso replaces Domingo Ureña-Raso (56), who has resigned from his position. Fernando Alonso has been working with Airbus for many years and has a profound knowledge of the A400M as well as the other military aircraft programmes. Since 2007, Fernando Alonso has served as Head of Flight Test Operations at Airbus. Further to the top management changes, the A400M programme will be restructured. · Responsibility for all industrial-related activities is being shifted to the Operations organisation, which is led by Pilar Albiac-Murillo. 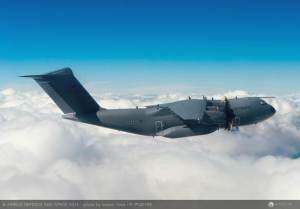 · Programme-related activities such as development and customer deliveries will remain in the scope of the Military Aircraft business unit, under the lead of Rafael Tentor, who serves as Head of the A400M programme. The current aircraft in service are showing good performance with the aircraft exceeding its specifications in its strategic, logistical role. The military capabilities consisting of aerial delivery, cargo handling system, Defensive Aids Subsystems (DASS) and air-to-air refuelling with pods will be integrated in the second half of 2015, following certification and qualification for each capability. Flight testing of these capabilities is continuing at a high pace. Additional military capabilities will be integrated gradually up till 2018 as contractually agreed. We are continuing our intense and constructive discussion with OCCAR and the customer nations regarding the delivery schedule and will communicate on this once those have been concluded. With regard to any potential financial impact of the revised delivery schedule a review is currently underway as indicated in November and its results are expected to be communicated at the Group’s 2014 Annual Results Disclosure on 27 February 2015. January, 5, 2015 – Israel Aerospace Industries (IAI) concludes year 2014 with cyber-solutions contracts totaling dozens of millions of dollars. Two significant contracts were signed with strategic, defense, foreign customers. IAI has defined cyber as a strategic domain and one of the company’s core areas of activity. IAI develops advanced cyber solutions for intelligence, protection, monitoring identification and accessibility. These sophisticated capabilities are made possible by unique technologies developed by IAI’s research, development and excellence centers. The company is offering to its customers numerous channels and dimensions for handling the various, constantly evolving cyber threats. “The Cyber arena requires reliable, strong and experienced solutions’ provider in order to allow appropriate, constant managing. We’ve harnessed the best minds and technologies to create a new approach, enabling our customers for optimal management of today’s and tomorrow’s cyber challenges,” said Esti Peshin, director of cyber programs at IAI. Defence and security company Saab and the Brazilian Ministry of Defence, through the Air Force Aeronautics Command (COMAER), have signed a contract for Gripen NG contractor logistics support (CLS). The total order value is SEK 548 million. The order is expected to be booked by Saab in 2021. The CLS contract includes continuous maintenance and support services for the Gripen NG aircraft, and their associated equipment, that will be delivered to Brazil during the five years between 2021 and 2026. The CLS services will be provided to COMAER by Saab and its Brazilian partners. ”This contract secures the Gripen NG logistics support solution for Brazil. It is also an important part of Saab’s commitment to deliver the Gripen NG system to the Brazilian Air Force,” says Ulf Nilsson, Head of business unit Gripen within Saab’s business area Aeronautics. The CLS contract is supplementary to the main contract with Brazil covering development and production of 36 Gripen NG aircraft, which was announced on 27 October 2014. The CLS contract will come into effect once certain conditions linked to the main contract – such as the delivery of aircraft – have been fulfilled. Defence and security company Saab has received a development order for Gripen E from the Swedish Defence Materiel Administration (FMV). The order is part of the Gripen E framework agreement from 2013 and is valued at SEK 385 million. “The work on Gripen E goes according to schedule and budget. The order is part of the high-tech development of the next generation Gripen system to Sweden”, says Ulf Nilsson, Head of business unit Gripen within Saab’s business area Aeronautics. 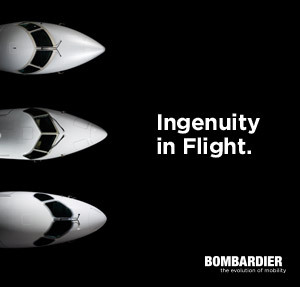 Gripen is unique in combining high technology and capabilities with cost efficiency. Gripen E has significant performance improvements, including a more powerful engine, longer range, more weapons, new AESA radar and more advanced avionics. Airbus Defence and Space has formally delivered the first Airbus A400M military transport ordered by Germany. A total of nine aircraft have now been delivered and the aircraft is in service with four nations. The Bundeswehr accepted the aircraft at the A400M Final Assembly Line in Seville, Spain on 18 December. Bernhard Gerwert, CEO Airbus Defence and Space, said: “We are extremely proud to hand over the first A400M to Germany. The A400M will play a critical role in the modernisation of Germany’s air mobility force. The unique combination of strategic and tactical capabilities, allied to a level of reliability greater than that of the previous generation aircraft that it is replacing, will transform the German Air Force’s transport operations in the coming years.” The A400M will replace the C-160 Transall. The photograph shows the first German A400M during its maiden flight. 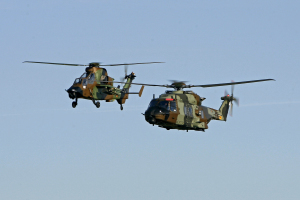 Albacete, December 18, 2014 – Airbus Helicopters has completed official delivery of the first two Tiger helicopters in the new HAD-E version and the first NH90 GSPA tactical transport helicopter destined for the Spanish Army Airmobile Force (FAMET). These three helicopters were assembled in the Spanish plant in Albacete, which successfully carried out the industrial phase, airworthiness certification and technical acceptance. “The delivery of these three helicopters is a very important milestone for our company and we wish to thank the Spanish Ministry of Defense for trusting in us,” declared Francisco Vergé, CEO of Airbus Helicopters España. “Our close relationship with the Spanish Army and the different departments of the Directorate-General of Armament and Equipment (DGAM) has been crucial to ensuring the success of these two high-tech programs”. The NH90 is the backbone of the industrial projects at Airbus Helicopters España. It was the first program to be promoted by the Spanish Secretariat of Defense, with the support of the Ministry of Industry through the DGAM. Its aim is to meet the operational needs of the three branches of the Spanish Armed Forces through a common platform adapted to the requirements of each mission and featuring all the latest technological developments. In this way, it seeks to improve effectiveness and streamline operating expenses by reducing and modernizing the current fleet of helicopters and ensuring their sustainability over time. Airbus Helicopters España will supply a total of 22 NH90 helicopters to the Spanish Armed Forces under a delivery schedule that continues through to 2021. The Spanish plant is responsible for assembly of all the NH90 helicopters for the Spanish Armed Forces, along with manufacture of the front fuselage section both for the Spanish helicopters and for those destined for export. The Spanish version of the NH90, the GSPA, has been designed to perform technical missions such as troop transport, search and rescue missions, personnel recovery and medical evacuation. It is equipped for day and night operations in all types of environments. As for the combat helicopters, Tiger deliveries belong to the new HAD-E version, which offers numerous advantages compared to the HAP-E Tigers currently in service: a new MTR-E turboshaft with 14% more power, an improved optronic vision system, Spike air-to-ground missiles, an Identification Friend or Foe (IFF) system coupled with an interrogator and a new electronic warfare and countermeasure system. The Spanish Army purchased a total of 24 of these helicopters. To date, six HAP-E Tiger helicopters have been delivered to the Attack Helicopter Battalion. Their satisfactory deployment in Afghanistan during 2013 represents an important milestone for this helicopter. The Industrial Participation Plan designed for these programs has ensured that Spanish industry, headed by Airbus Helicopters España, is fully involved in the entire life cycle for these helicopters, from the design stage through to flight testing and certification, component manufacture, the final assembly line and integrated support. Albacete is the only site that manufactures the rear fuselage section of the Tiger helicopter and the front fuselage of the NH90. 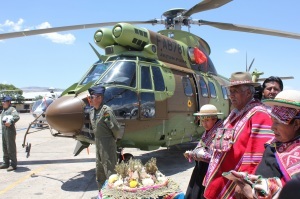 Bolivia, December 12, 2014 – Airbus Helicopters has delivered the 2nd Super Puma AS332 C1e to the Bolivian Air Force (FAB). At the end of 2013, the FAB purchased six of these light-medium helicopters to fight drug trafficking and perform civil security and public service missions throughout the country. The first helicopter was delivered in August of this year and the four remaining helicopters will be delivered between now and 2016. The official handover ceremony held in Cochabamba was attended by Bolivian President Evo Morales, members of the FAB High Command, France Ambassador in Bolivia, Mr Michel Pinard, and Airbus Helicopters representatives. The contract for the Super Puma helicopters also includes a logistical support package that aims to provide the FAB with the resources and know-how it needs to ensure a high level of fleet availability. Since the arrival of the first Super Puma last summer, the FAB has benefited from the services of a permanent technical expert and the support of an instructor pilot and maintenance instructor to ensure these new helicopters enter smoothly into service. The spirit of cooperation between the two countries is also reflected in the technology transfer program to foster the development of the aerospace industry in Bolivia, which has seen more than 100 pilots and technicians of the FAB receive training. The long-standing relationship between the FAB and Airbus Helicopters dates back to the 1970s with the Lama and Alouette. In 2009 these were replaced by the Ecureuil AS350 B3, a helicopter that stands out due to its excellent performance in high & hot conditions and which has proven its versatility on demanding missions such as the aerial work on the cable car in La Paz at an altitude of 4,000 m and also for the Dakar Rally. In 2012 the FAB added two EC145 helicopters to its fleet, which were followed by another two in 2014. All four of these powerful twin-engine rotorcraft are used for VIP transportation and to provide support in the event of natural disasters and emergencies. These EC145s already demonstrated their versatility, resilience and reliability during the rescue operations following the floods that ravaged the eastern part of the country at the beginning of this year and on missions to transport authorities during the G77 summit held in June in the Bolivian city of Santa Cruz. The Super Puma family is particularly well suited to operations in Latin America, where more than 110 helicopters are currently in service and more than 50 are on order. Its ability to operate at high altitude, in the jungle and at extreme temperatures allows it to overcome the region’s unique challenges, especially in the mountains and plateaus of the Andes, where altitude and temperature often prove challenging. With more than 4.75 million flight hours around the world, this fast, powerful, reliable and safe helicopter has become the benchmark in its class and is in service in virtually every country in Latin America. It is perfectly suited for a wide variety of missions ranging from tactical transport to public service, surveillance, medical evacuation and the fight against drug trafficking. Among the major assets of this helicopter, which can be rapidly configured for different missions, are its adaptability and versatility. These facets have helped it earn the confidence and trust of 94 customers in 48 countries. Airbus Defence and Space has delivered the first Airbus A400M new generation airlifter to the Royal Air Force, beginning the next stage of the transformation of the United Kingdom´s air mobility fleet. The aircraft is the first of 22 ordered by the UK and will be known in service as the A400M Atlas. Prime Minister David Cameron was today guest of honour at a ceremony to celebrate the acceptance of the aircraft at RAF Brize Norton, which is in his parliamentary constituency, where the entire Atlas fleet will be based. He was accompanied by Minister for Defence Equipment Support &Technology Philip Dunne. Executive Vice President Military Aircraft, Domingo Ureña Raso, said: “It is an enormous pleasure to see the A400M entering service with the RAF which is one of the leading exponents of military air mobility worldwide. I would like to express my sincere thanks to all our employees, especially those in the UK, as well as OCCAR and our UK customer for making this day possible. The A400M will replace the C-130 in RAF service but, because it can carry approximately twice as much load, or the same load twice as far, fewer aircraft will be required. Uniquely it is able both to cruise at jet-like speeds and altitudes over intercontinental ranges due to its extremely powerful engines and advanced aerodynamic design, as well as to operate repeatedly from short and unprepared airstrips close to the scene of military action or humanitarian crisis. At Brize Norton the A400M will operate alongside the RAF’s Airbus Voyager multi-role tanker transport fleet. The wings of both aircraft are built in the UK at Filton and Broughton respectively. Additionally the Voyager’s engines are produced in the UK by Rolls-Royce, which is also a member of the Europrop International consortium that produces the A400M’s TP400 engines. Altogether the A400M supports some 8,000 jobs in the UK including around 900 Airbus Group employees working directly on the aircraft at Filton. To date eight nations have ordered 174 aircraft of which the first seven have now been delivered. that shapes the future of combat aerospace in Europe. ceremony at Dassault Aviation’s headquarters, Saint Cloud, France. [Eur]100m/[Pounds]80m in the same period. addresses both nations’ future military requirements. 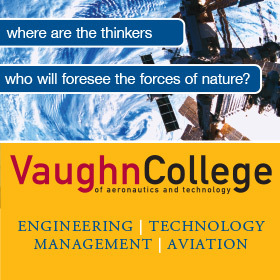 maintaining a cutting edge, sovereign military air capability. EL SEGUNDO, Calif., Nov. 4, 2014 – Boeing [NYSE: BA] has proven its new anti-jamming communications technology is capable of operating as either a ground-based user terminal or satellite-based networking hub, enabling the military to send and receive secure communications at a significantly lower cost by using existing terminals and satellites. The anti-jam technology uses a protected tactical waveform, which shields signals from interference by adversaries or cyber-terrorists. This demonstration complements previous on-orbit demonstrations over satellites like ViaSat-1 and the sixth Wideband Global SATCOM (WGS-6), showing the ability to operate anti-jam waveforms over existing commercial and military spacecraft. The recent test was conducted between a Boeing ground terminal using a programmable modem, designed and developed by ViaSat using one of its commercial off-the-shelf platforms and a ground terminal designed and built by MIT-Lincoln Laboratory. This testing, done under contract for the U.S. Air Force Space and Missile Systems Center and supervised by the U.S. government, confirms that the modem meets technical interface specifications, while successfully transmitting information to and from the ground user terminal.